Made from Polycarbonate . Flame retardant to UL94V2. Item Code: LJ8P-CAT6-10. Category: Plugs. 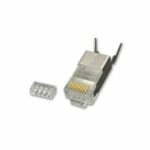 RJ45 plugs are not all the same and the basic plug that it used for CAT5e will not do when making CAT6 patch leads. 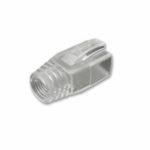 A CAT6 plug is constructed so that there is minimum crosstalk between the plug pins when assembled and this is attained by staggering the pins for maximum performance. A 2 part construction allows easy termination into the Cable. This usually preferred over the 3 part version on the market which is fiddly and not reliable.